It seemed the weather was alternating with a sunny day and a rainy day. This day would be rainy. We did not have far to go again but most of the way was going to be on gravel roads and in the rain. 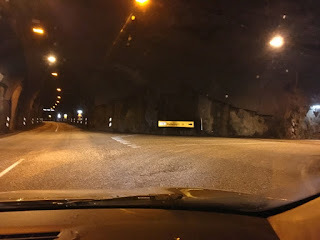 And wouldn't you know it, the drive would start with a tunnel. 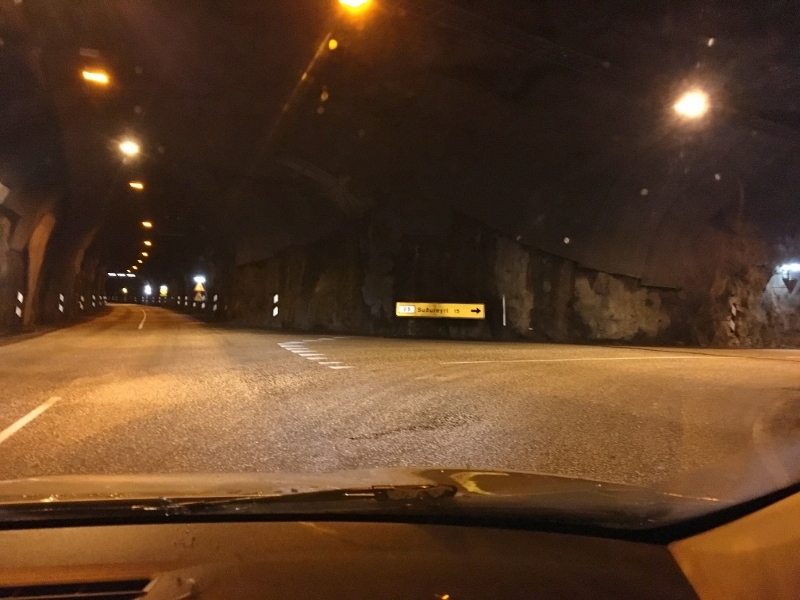 Not just any ordinary tunnel either. This one had an intersection in the middle of it! It started out with two lanes but after the intersection it turned into one. We only had to pull over once though and thankfully not for a big truck. I was happy to see daylight again even if it was wet daylight. When it was time for our morning rest stop, we found a hotel in Pingeyri (or Thingeyri. The P is a funny letter, more like a symbol, that stands for th.) and stopped for coffee. The lovely lady who was just finishing up serving breakfast for their guests sat us down and delivered a whole carafe of coffee to our table. We were the only ones in the rather large dining area. She began a conversation with us that went nonstop while we drank our coffee. I excused myself to take my turn in the restroom and when I returned, we began to gather our things to leave. "Oh, wait," she said, "You must try this." 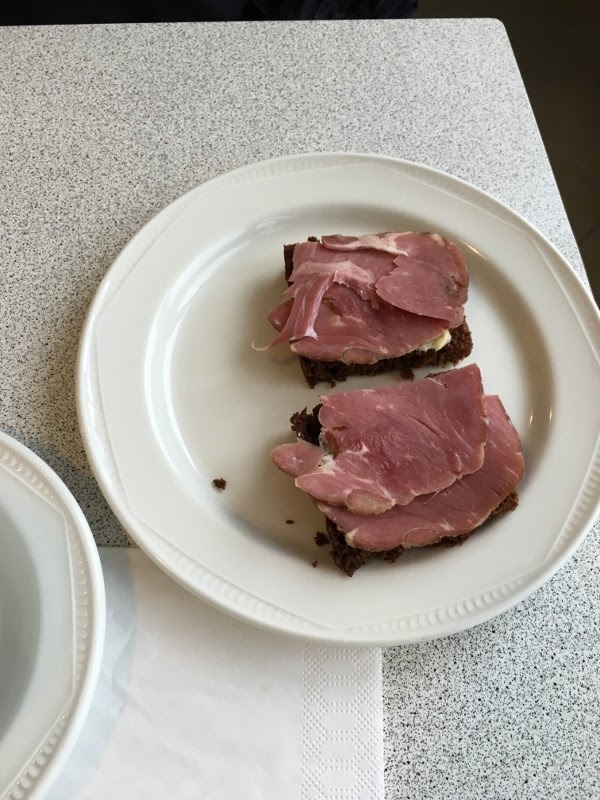 She finished buttering a second piece of dark brown bread and placed two slices of meat on it. "This," she said handing us a plate with two small open faced sandwiches on it, "is smoked lamb and my grandmother's rye bread." I said we hadn't had a chance to try smoked lamb yet and smiled gratefully. We sat down again and munched on our snack as she told us how her grandmother used to bake her rye bread in the geyser for twelve hours. She giggled as she said she does her grandmother's bread in a modern oven but it still takes twelve hours. The bread wasn't a hearty rye taste and was rather sweet. The smoked lamb delicious as well and the combination was a real treat. 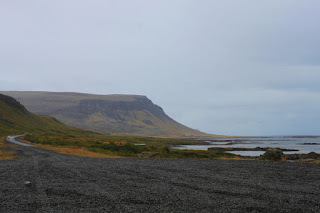 I was again amazed at the hospitality shown us by the Icelanders we'd met. After Pingeyri we were back to gravel roads and it was raining pretty steadily. The car was going to be filthy by the time we got to our destination. 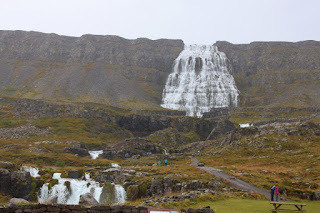 We pulled off the main gravel road a while later to see what was said to be the biggest waterfall in the western fjords, Dynjandi or Fjallfoss. It was raining pretty good now so we positioned the car and put the window down to take our pictures. There were plenty of people in rain gear obviously from a couple of tour buses who were making their way up to the waterfall. I read that you can walk behind it. We'd done that with another waterfall--no need to do it again especially in the rain. We did a Chevy Chase head nod, rolled up the window, and moved on. As we drove on, we also drove up. We were climbing. Our GPS told us we were at 1400 feet on the mountain. It was really slow going with heavy winds that rocked the car every so often. The rain wasn't so heavy now but it was certainly blowing. I couldn't imagine winter here--or maybe I could. I shivered. Flokalundur was just a hotel and small self serve gas pump. If there was anything else, it was closed up already in preparation for winter and this was the last week our hotel would be open. Down around the bend in another direction was a hotel as well but apparently ours was the only one with a restaurant. We had a lunch of mushroom soup and salad. 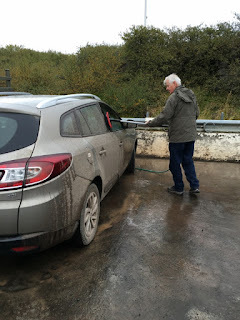 While we ate, we noticed that cars were pulling up to a wall of sprayers and using them to wash their cars off from all the accumulated mud of the gravel roads. 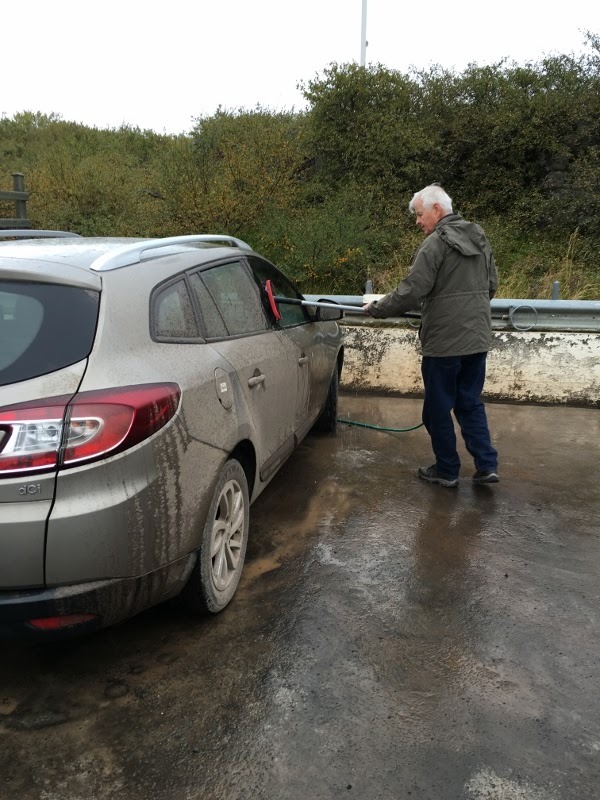 Bob would manage a car wash after we ate. With a clean car, we decided to drive a little further from our hotel just to explore until it was time to check in. The landscape was unusual. Large islands indicated on the map were actually attached to shore by a small causeway--gravel of course and I think they were probably F roads. The major interest point in the immediate area however was right near our hotel--a hot spring. The hotel told us we could borrow robes and a towel if we wanted to indulge so of course we had to check it out. It was a bit of a walk from the hotel and I couldn't imagine going the distance in a bathing suit and robe especially upon the return when we would be dripping wet. We would think it over and if I was brave enough, we'd do it the next day. While we were looking for the hot spring, we happened upon a couple of mushrooms that at first I thought were plastic. 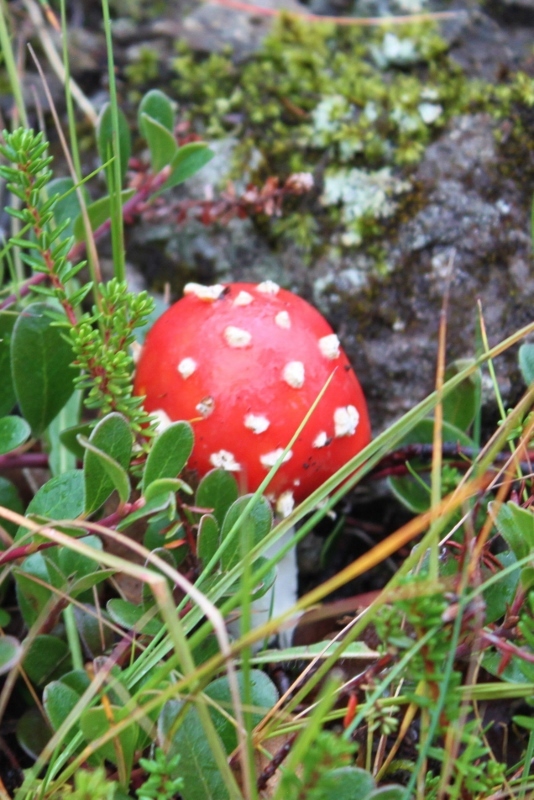 I've seen plastic mushrooms or drawings of red mushrooms with white dots but I had no idea they were a real thing. There were two of them growing along a path to the water. I was fascinated but as much as I love mushrooms, I couldn't imagine eating anything so pretty. 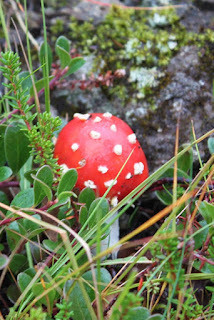 Of course later I discovered that they are poisonous especially if not cooked properly so no, I wouldn't eat them anyway. With the rain and the tedious drive, we took the afternoon off and just did some reading and listening to the wind howl. Our room was large enough to have a nice sitting area so it felt a little like home away from home. Dinner in the restaurant was nice. We had lamb and lightly salted cod. After dinner, Bob struggled to find the live feed he'd been able to watch of the Ohio State game the week before. He never found it and had to settle for a site that just updated the score every so often. Thank goodness it wasn't a conference game!